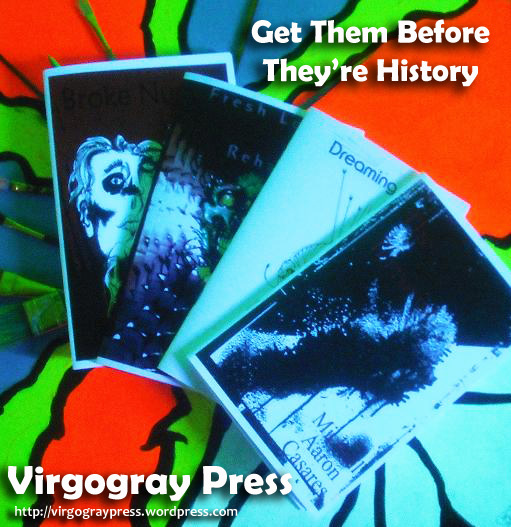 Virgogray Press is looking for writers interested in reviewing our chapbooks. If you would like to write a review of one of our books, please contact us. Let us know which title you are interested in reviewing, as well as give a brief synopsis of your experience with the writing/publishing industry. Publishing credits are acceptabel. Please include a mailing address as we will send a copy over for review. We at Virgogray reserve the right to accept or refuse review requests. There is no payment for review. However, your re﻿﻿﻿﻿﻿﻿﻿﻿﻿﻿﻿﻿﻿﻿vie﻿w will appear in publication on the website, and possibly in other various publications both in print and online. E-mail all inquiries to Michael Aaron Casares at michael.aaron.casares@gmail.com.